CLICK HERE to donate today (and select the Chanukah Campaign from the fund menu). GET BEESWAX CHANUKAH CANDLES AND SUPPORT SHORESH’S WORK CONNECTING PEOPLE, LAND, AND JEWISH TRADITION! We have an extremely limited supply (only 36 boxes!) of hand-dipped, 100% pure Canadian beeswax Chanukah candles, lovingly made by the Sisters of Holy Theotokos Convent in Stouffville, Ontario. 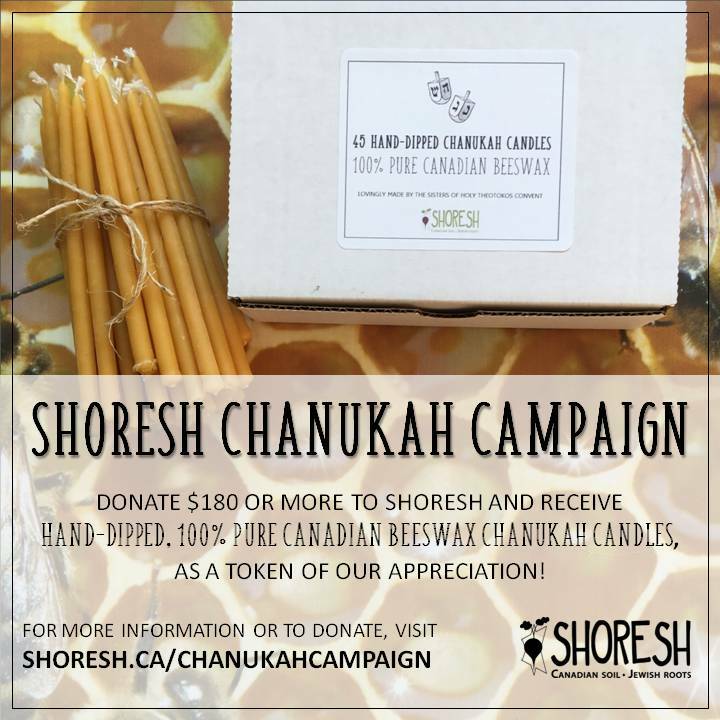 Be one of the first 36 people to make donations of $180 or more to Shoresh this week, and in gratitude, we will gift you a box of Chanukah candles in time for this year’s Chanukah celebration! ***To arrange for porch pick-up, please let us know the day before so we can leave the candles for you in a labeled bag. Donate $360 or more and we will hand-deliver your candles to you! ***To have candles delivered, recipients must be located in the Toronto, Vaughan, or Thornhill areas. Deliveries will take place by 12pm on Tuesday, December 12, 2017. Or make a donation of any amount and feel good knowing you are helping to create a healthier, greener tomorrow!